Upvc doors and windows are built to be convenient and easy to use. If you want some fresh air, just open the window and it stays where you put it. You can open it a little bit or have it wide open. The down side of this is if you've got children (or even pets) who might want to push an upstairs window open a bit more and could be in danger of falling out. Most outward opening windows have a 'night vent' locking position, but this might not give as much ventilation as you want, or you might not lock you're window handles all of the time. One solution is to fit a window restrictor. These come in a few different forms which can all be retro fitted. There cable restrictors which require a key to undo, or concealed catches which require two hands to open and are difficult for children to operate. 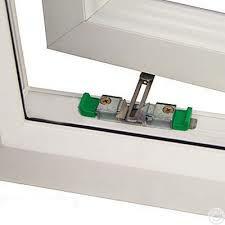 It's also possible to fit restrictor friction stays which replace the existing window hinges and again have a two handed operation to open. Doors are similar except they don't have anything to stop them blowing in the wind once opened. Again a cable restrictor could be fitted to allow ventilation or, for outward opening doors we could fit a restrctor stay which will prevent the door from slamming shut or swinging back onto brickwork (which can break the hinges and/or mis-align the door). For a quote & some free advice please get in touch. Newer PostOil your locks and save some money!